I love single skein projects. I do. If a publisher approached me and said: “Alicia, we want you to design a book!” I’d say “Can it be single skein projects?!?!? !” (Hint hint to any publishers out there.) Well, of course, that’s if they specified YARN specific book, otherwise, I’d do a book with a bit of this and bit of that. I LOVE one skein projects though because you can spontaneously buy a skein of yarn as a total impulse purchase (or you know, on purpose with a plan, if that is your thing) and then you can sit down and work a bit, and WAHLAH! A scarf or hat or shawl, or what have you and your beautiful impulse purchase becomes a beautiful item you can use!! In this case, it’s a beautiful Puff Stitch Cowl, which matches my Puff Stitch Hats that I made! Both hats and this cowl were made using Lion Brand Mandala (serious I love the stuff! and NO I am not paid to say that! Hint hint to Lion Brand this time. LOL) in the colorway Gnome. The hat pattern is NOT mine and can be found on Ravelry. 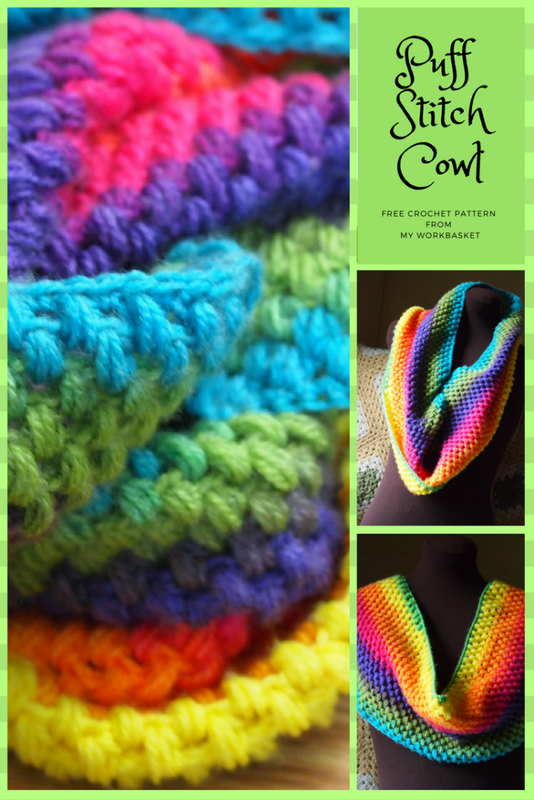 This cowl pattern IS mine but is super simple so there is probably similar ones out there. The two hats AND a matching cowl will take 2 skeins total. 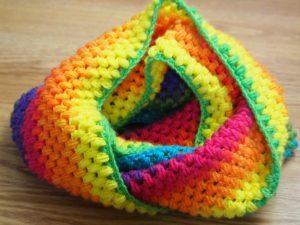 A single cake of Mandala will complete the cowl. Using Mandala or another DK weight yarn, and an I hook you should get a gauge of 2 puff stitches and two spaces per inch. Gauge is not critical though, so anything close will be fine! You just may get more or less rows in your finished item. 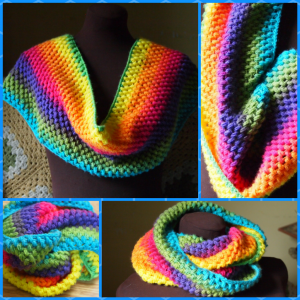 My Finished Cowl is 8.5″ Tall and 52″ all the way around, 26″ when measured flat. It is long enough to wear in a variety of ways, and when doubled can be around the neck for extra warmth, OR even pull one layer up to cover your ears and head! Even more than a single skein project I ADORE a single skein versatile project! Chain 1 more, then turn and sc in each stitch across. NOW join in the round with a slip stitch. It will be easier to make sure your row isn’t twisted since it is so long, and it can easily be stitched up and made even when your project is finished and you weave in your ends. Now that it is joined you’ll be starting your puff stitches. Make a *puff stitch in the next sc, skip 1 sc repeat from * around. Join with a slip stitch at the end of the round, and begin the next round. Because you pull up loose loops to do a puff stitch you should not need to ch to go up a row. I find the cleanest start by doing your first puff stitch in the space AT your join. Your new puff stitches will go in the gaps between the old puff stitch. Make 24 rows of puff stitch. Last Row: SC in each puff stitch AND each gap space all the way around. Slip stitch together and end off. What do you think? Do you tend to impulse buy yarn? Or buy yarn with a project in mind? Previous Post: Listerine- And it’s Interesting 1930s ads.